It’s cold right now but BBQ season is right around the corner! When that time is here we use many tools to help us improve our cooking experience. Sophisticated barbeques, cool tongs, BBQ cleaners and so many gadgets to help you cook. We would like to spotlight some amazing BBQ products that Spark has developed in conjunction with Proud Grill Company Limited. Spark Innovations Product design team worked on the entire product design process, achieving a final product which is sold in stores and online today. One of these innovative products is called The Q-SWIPER™ Grill Cleaner. The inspiration of the Q-SWIPER™ Grill Cleaner arose from the risks associated with grilling. One of the potential risks is the accumulation of harmful carcinogenic residue. It is recommended to scrape down your grill after each time you use it to ensure you reduce the buildup of potential carcinogenic residue. You run the risk of transferring these harmful chemicals to the next meal you cook on your BBQ if you don’t. Other risks that typical brush cleaners use steel bristles which are known to loosen over time and dislodged onto your grill, which eventually is transferred to your food. Product design for safe barbecuing! The Q-SWIPER™ Grill Cleaning Wipes, which are used in conjunction the Q-SWIPER™ Grill Cleaner, are moistened pieces of cloth that are food safe, provide strong cleaning agents that help remove grease and cut down on dangerous flare-ups and carcinogenic residue. The Q-SWIPER™ Grill Cleaner is Bristle Free and Wire Free so it avoids the potential danger of ingesting loose steel from wire brushes. 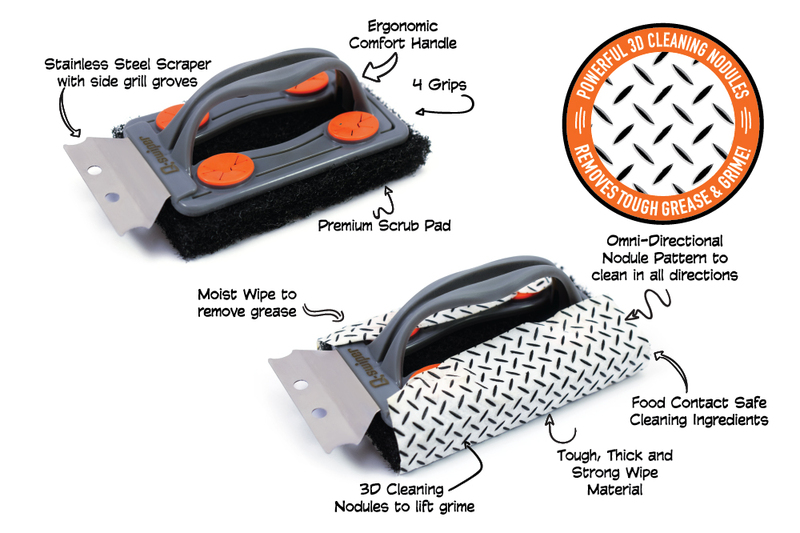 This patent-pending grill cleaner system combines the Q-Swiper Grill Brush with a stainless steel scraper and replaceable Q-Swiper Grill Cleaning Wipes with 3D Cleaning Nodules. The scraper removes the burnt-on food particles and the moist Q-Swiper wipe absorbs the grease while the omni-directional 3D cleaning nodules lift the grime. 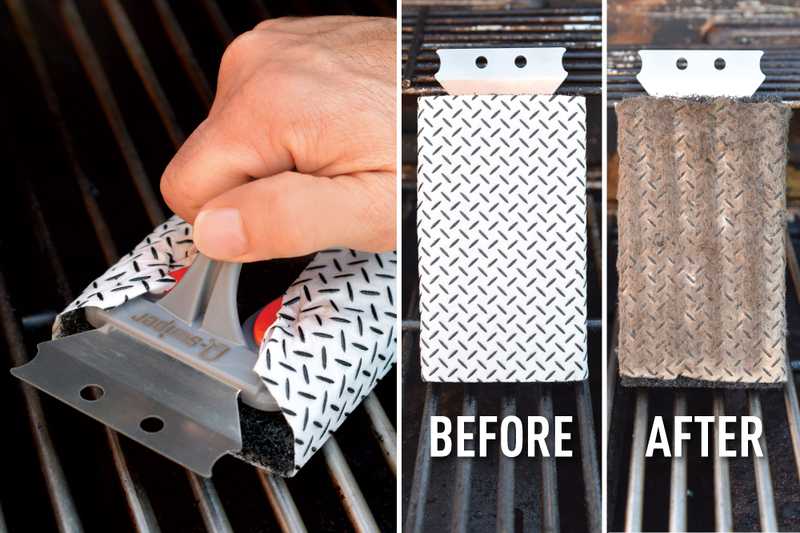 So stop using the same dirty brush, pad or wood scraper over and over, and try the new Q-Swiper Grill Cleaner, a bristle-free way to get a clean grill every time you barbecue this summer. Product design for these cool new BBQ skewers. Spark Innovations worked on every phase of product design of this project from the initial concept, testing, prototyping, packaging, and marketing materials for pitching and manufacturing. These food grade stainless steel BBQ Skewers are an innovative design that keeps food from falling off or spinning while flipping. They are easy to load and stay in place thanks to the tip of each stainless steel arm. They hold twice the amount of food than regular skewers while providing double sided skewers which balance evenly on the BBQ. Fun designs for every type of food, dishwasher safe & reusable, perfect for veggies, meat, fish & more. If you are thinking about developing a new idea and need help with product design call us for a free consultation.